Drizzle olive oil in a large foil pan. Toss in crushed garlic. Place on grill and cook until garlic is softened, about 6-8 minutes. Add diced tomatoes to the foil pan. Cover grill and cook for 10 minutes or so, until the tomato sauce is piping hot. Stir in salt (add more or less according to taste). Toss in fresh basil. Serve immediately over pasta or fresh grilled asparagus. Go Italian or Go Home! This easy tomato-basil sauce is made on the grill in minutes! Toss a few verrry simple ingredients together and get yourself on over to Tuscany tonight! This ridiculously simple tomato sauce is made on the grill so you won't be heating up your kitchen, not to mention the cray cray deliciously fresh flavor will quite literally transport you to authentic Italian goodness! It's this easy, amore mio's! 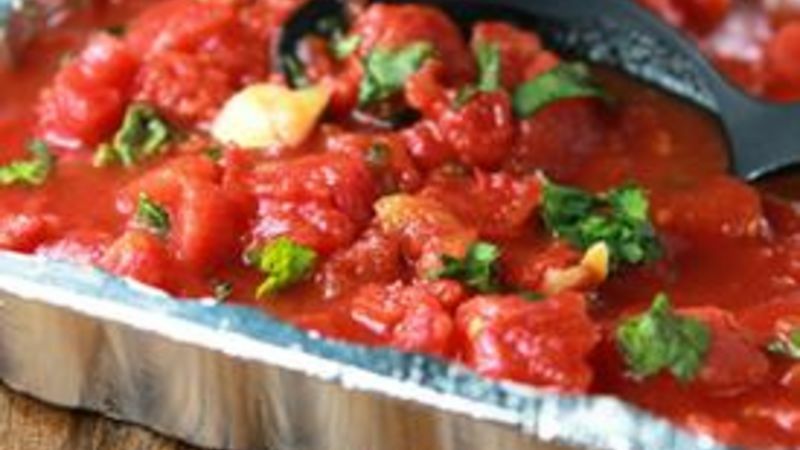 Grab yerself a foil container, Muir Glen Diced Tomatoes, garlic, olive oil, and basil. Okay, and salt. Don't let that extra ingredient throw you for a loop. Crush your garlic and toss it into the foil pan with some serious olive oil action, and toss all that all onto the grill. For reals. It's this easy. Warning: you have officially reached the hardest part of this recipe. OPEN THE CAN. Toss tomatoes into the sizzling garlic. Wipe thy brow. You made it. Once the tomatoes are boiling and bubbling, pull the foil from the grill, and add a bit of salt. Then stir in boatloads of basil. No, not actual boats, yo. Think Venetian gondolas. Filled with basil. Tunneling through your homemade, super-easy Roasted Tomato & Basil Sauce. Which you can now pour on top of your favorite pasta, or directly down your throat.